Std. Displacement. . . 4,200 tons Draft . . . . . 16' approx. (a) C.O. OGLALA ltr. CM4/A16-3/S81-3/(0103) of Dec. 31, 1941. (b) Report of Damage to U.S.S. HELENA prepared by Buships, dated February 21, 1942. 1. U.S.S. 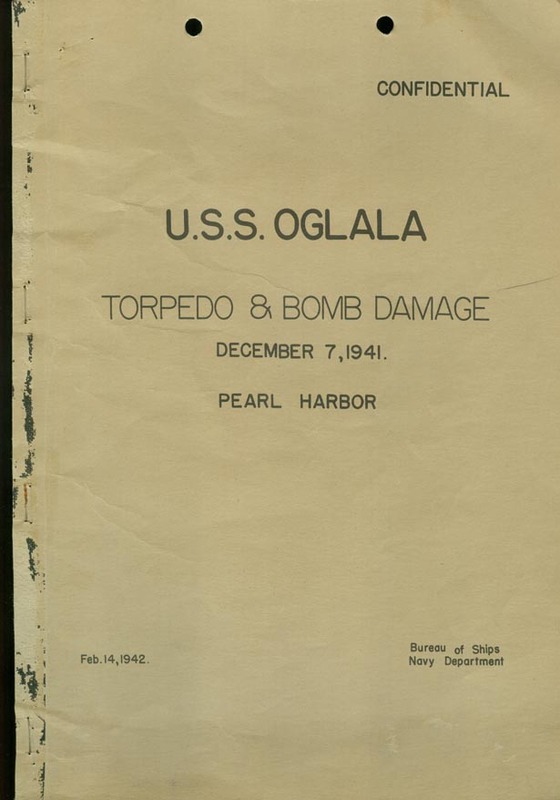 OGLALA was moored port side to and outboard of U.S.S. HELENA at Berth 2, 1010 Pier, Navy Yard, Pearl Harbor, on the morning of December 7, 1941. The distance between ships was about 8 feet, and the depth of water about 42 feet. The weather was clear, with visibility somewhat hampered by scattered clouds. 2. General Quarters was sounded about 0755, and almost immediately thereafter a torpedo plane was seen to drop a torpedo from close aboard on the starboard beam; HELENA'S estimate of the range was 500 yards. The torpedo ran under OGLALA and struck HELENA as described in reference (b). Relative positions of the two ships and the torpedo are shown on Plate I. 3. The explosion occurred in way of the fireroom, lifting up the floor plates and rupturing the hull. There was a severe shock and a general flexural vibration of the ship. No flash, flame or smoke was observed, as HELENA received the direct effects of the explosion. 4. Several Japanese planes strafed the decks with machine gun fire at the same time, and two or three minutes later a dive bomber dropped a bomb which fell between OGLALA and HELENA and exploded, also abreast or just forward of the fireroom. This detonation was likewise violent and caused a severe shock and a general flexural vibration of the ship. A geyser of oil and water was raised which fell on deck. No flash, flame or smoke was noticed, indicating that the bomb had a delay-action fuze which exploded the bomb under water. 5. The bomb explosion between the ships was not reported by HELENA, though several near-misses are mentioned in the reports listed in reference (b). It evidently exploded in about the same position as the torpedo and may well have been of the armor-piercing type which is presumed to have caused relatively minor near-miss damage on HONOLULU. 6. No data on the Japanese airplane torpedoes used at Pearl Harbor are available at present. Probabilities are discussed in reference (b). 7. The fireroom started to flood rapidly, but personnel had time to secure the fires, abandon the fireroom, and close the watertight doors. The engine room also began to flood, apparently slowly as a result of the torpedo explosion and more rapidly following the bomb explosion. By 0830 the ship had a 5 degree list to port and was settling by the stern. She was dry forward of the engine room but flooding rapidly aft. No power was available for pumping and it was obvious that the ship could not be kept afloat much longer. 8. Two tugs were commandeered (YT-146 is mentioned in a report on yard craft activities that day, but at this point the identity of the other tug is unknown) to pull the ship clear of HELENA, and by 0900 she was berthed astern of HELENA (Berth 3). All mooring lines available were used, but the list and trim continued to increase. By 0930 the list had reached 20 degrees and service of the guns could not be continued. The machine guns were removed and the order given to abandon ship. 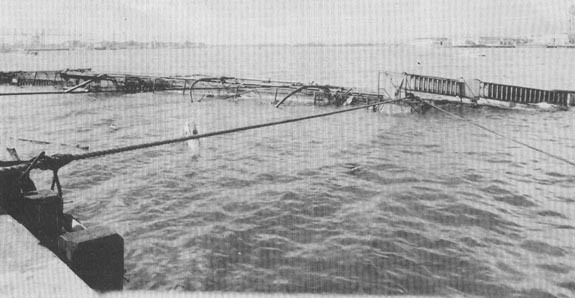 OGLALA capsized and sank just before 1000, resting on her port side as shown by Photos 1 and 2. 9. No estimate of damage is available. Plate I shows its probable extent, based on estimates made from the accumulated records of the Bureau. 10. The ship had refuelled two days earlier, and all fuel tanks were practically full. All fresh water tanks were full and reserve feed water tanks were about 90% full. Port bunker storeroom (B-106) flooded. No. 3 hold partially flooded and filling slowly (this space not so designated on plans, but evidently is the compartment abaft the engine room which now contains the fuel oil tank D-202 and extends back to bulkhead 133). Shaft alley, No. 4 hold, and other spaces aft may have flooded but could not be examined. Forward compartments probably flooded through open ventilation system. There was no voluntary or counter-flooding. 12. Both explosions caused severe shocks. The circuit breaker of the operating generator opened. The port flushing pump in the engineroom broke loose from its foundation. Men were thrown from their bunks. 13. The ship was in a modified Condition Baker at the time of the attack, with ports and hatches open as necessary for the comfort of the crew. Condition Afirm was probably not adequately set after General Quarters was sounded. Several ports in an office on the starboard side were left open. Photo No. 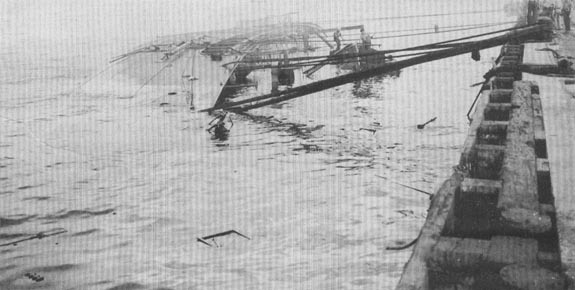 1: USS OGLALA sunk at 1010 dock. Photo No. 2: View looking aft.